In the past – and even now - IT departments have employed authentication methods that required end users only to provide a valid user ID and a password. Hackers have been successfully targeting user names and passwords as an entry point for malicious attacks for some time. To stay ahead of hackers, you need best practice Intelligent Authentication methods that include both strong and risk-based authentication. Please join Carole Gunst, Sr. 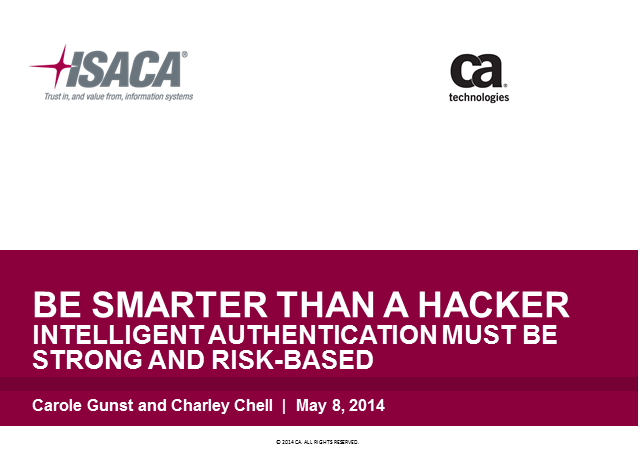 Principal and Charley Chell, Sr. Director, Security Solutions from CA Technologies to learn which Intelligent Authentication methods are essential and what you can do to protect your organization with authentication methods that are both strong and risk-based.